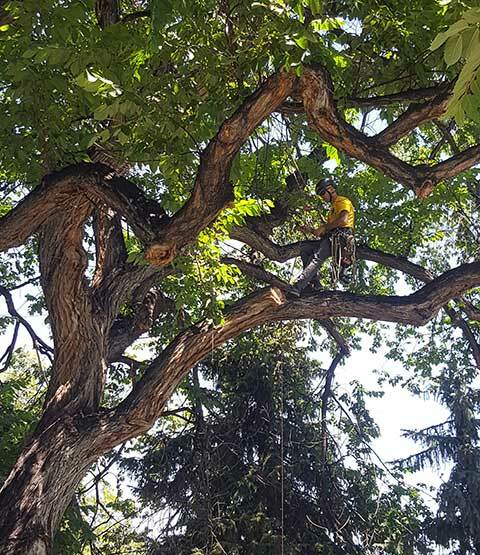 As part of our range of tree care services, Blue River Forestry & Tree Care provides reliable tree trimming and pruning services for our customers in the Boulder County area. Tree trimming and pruning are as much a science as they are an art form. Not only do they enhance the aesthetic beauty of trees, they also promote proper growth and structure. An arborist can determine the type of pruning necessary to maintain and improve the health, appearance, and safety of your Boulder County trees. The most common procedure in arboriculture and one we like to emphasize the most are tree pruning and trimming. This procedure is done for a variety of reasons and is always adapted to the speciﬁc tree species and the conditions of the environment. Health and Maintenance: In an urban forest such as Boulder’s, where trees have limited space to grow, structural problems can and will develop. Snow loads and other environmental factors such as high winds, place stress on our trees. Hiring Blue River Forestry & Tree Care’s certified arborists to evaluate your trees and develop a proper pruning schedule will help eliminate these risks. A typical trimming and pruning procedure will include the removal of dead, dying, diseased, crowded, weakly attached and low energy branches from the crown of the tree. Pruning may also include thinning of the canopy, which is the selective removal of branches to increase light penetration and air movement through the crown. This opens the foliage of the tree and reduces weight on the end of limbs. A certified arborist will evaluate and recommend what is needed for the overall health of your tree. Preparing for heavy, wet snow loads, high gusty winds and other forces of nature is important to the health of the tree, to prevent against breakage, torn bark and cracked leaders. Depending on the degree of damage, a tree may lose itʼs life to a badly cracked leader. With storms arriving in late October in the Boulder area, proper pruning will help your trees withstand the heaviest of snows. Another reason for trimming your urban trees is hazard reduction. Trees that have limbs that are hanging over playgrounds, roofs, buildings and city walks need to be regularly evaluated and pruned to create safe zones for the surrounding environment. Providing clearance for trafﬁc, walkways, buildings and other surrounding trees and plants is important in the urban environment. A crown raise is the removal of the lower branches from a tree to provide clearance. Blue River Forestry & Tree Care is up to date on all city ordinances for uplifting and clearance heights for Boulder tree trimming, as well as, surrounding cities. Tree trimming is not only great for a treeʼs health, but also for aesthetics. If you are selling your home or trying to increase your property value, having well pruned, maintained and healthy trees will give your property value that extra boost it needs. Please leave trimming your trees to the professionals, poorly trimmed trees not only develop weak structures and limbs, they are prone to a higher risk of storm damage and have less aesthetic value. The longevity and health of a tree can be greatly compromised when it has endured poor pruning. Depending on the species of tree you’re maintaining and other considerations, our ISA Certified Arborists can recommend the right maintenance for your trees and help keep your part of our urban forest both healthy and beautiful. At Blue River Forestry & Tree Care, we love trees and are committed to the health and care of yours! 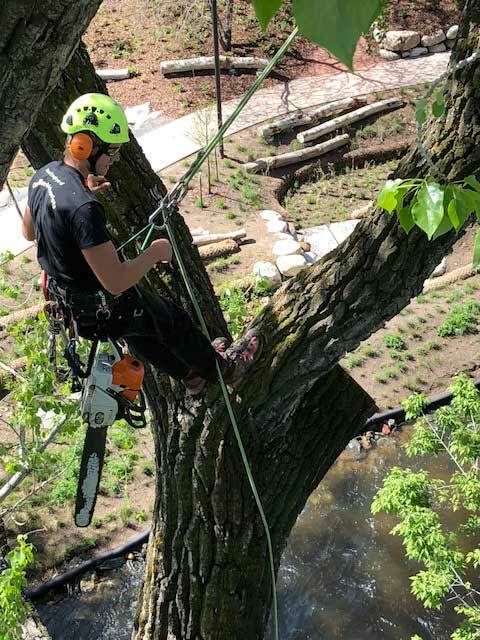 We offer all aspects of arboriculture, including tree trimming and pruning, tree removal, cabling and bracing, tree planting, Emerald Ash Borer consultation and treatment, plant health care services, and forestry services. We are fully insured and employ ISA Certified Arborists. We have the machinery, experience, and staff to manage all of your tree care needs, and provide tree care services to Boulder, Colorado, Louisville, Lafayette, Longmont, Niwot, and Erie. Are Your Trees in Tip-Top Shape?